Opel unveiled the Trixx minicar concept at the 2004 Geneva auto show, but the car never went into full-scale production. Opel/Vauxhall will build a new small car below its Corsa subcompact in Germany and may add an electric version, the automaker announced today. The company will invest 90 million euros (about $120 million) to build the model, code-named Junior, in its factory in Eisenach, eastern Germany, on an existing production line starting in 2013. The plant builds the three-door Corsa variant. With the minicar, Opel is delivering on its promise to expand its product portfolio and enter new segments, Reilly said in a press statement. He said the new model will be a stylish and fuel-efficient car with "innovative technology and an exciting design." An Opel press release said: "The future car is geared toward customers who need a small-sized fuel-efficient car in urban areas, for example, but who do not want to compromise on technology, design or convenience." It added: "At a later stage, this car might also provide the opportunity of a battery-electric version for zero-emission driving in city areas." Opel said the investment will secure the 1,600 jobs at Eisenach. Opel's factory in Zaragoza, Spain, which also builds the Corsa, will receive additional Corsa production volume as the new minicar comes on stream. General Motors Co. has pledged to invest 11 billion euros until 2014 in its Opel subsidiary to boost sales. A small SUV and a coupe version of the Astra five-door hatchback are planned. Opel has remained outside the minicar segment to avoid clashing with its GM sister brand Chevrolet, which sells Korean-built entry-level cars in Europe. But Reilly convinced GM bosses in Detroit that Opel needs a minicar because there has been a structural change in customers' habits with more people downsizing to smaller cars. 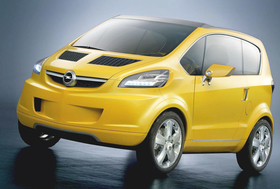 In 2004, Opel unveiled the Trixx minicar concept at the Geneva auto show but the 3+1 seater never went into production because GM decided at the time that the Chevrolet Spark/Matiz would be its only entry in the segment in Europe. Opel's announcement about the minicar is the third major investment commitment from the automaker this month. On Sept. 15, the company said it will significantly strengthen its Kaiserslautern, Germany, plant as a component manufacturing center and expand local engine production. Six days later, the company said it will invest 500 million euros in its engine plant in Szentgotthard, Hungary, to build a new facility for the production of three new Euro 6-compliant engine families.